This tab allows inspection and editing of the current documents defined (named) colours. By default all new Tinderbox documents have 28 defined colours. There are 10 greyscale colours named '0' though '9' (from light to dark) and 18 colours named for the actual colour ('green', bright red', etc.). The colours may be added to or deleted or the colour represented by the name may be changed. Delete color. Deletes the currently displayed colour. New color. Adds a new color to the list. The default name is 'new colour' and the default colour is #999999. Both the name and colour value can be edited. Colour controls. The colour chip shows the current colour defined. Clicking on the chip opens the OS' Colors dialog. 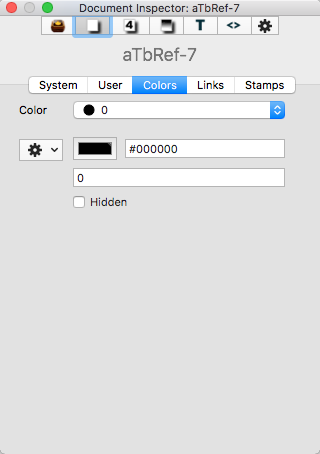 Any picker on the dialog may be used to define a colour which is used to update the colour chip and the hexadecimal code for that colour. Name box. This box shows the name stored for a defined colour. The name can be edited if desired. Hidden tick-box (default un-ticked). Unwanted system colours can be omitted from colour menus and lists. To hide a colour, select it and tick the "Hidden" box. Hidden colours can still be used in rules and actions, and their definition can be changed in this Inspector. However, the hidden colours no longer show in menus and pop-up colour lists. See more about Colours in Tinderbox.